During and after the 2010 BP oil spill, clean-up crews relied heavily on chemical dispersants to break up oil slicks in the Gulf of Mexico. In total, crews used more than 2 million gallons of dispersants, namely Corexit 9500 and 9527, applying them directly to the head of the leaking well and over the surface waters of the Gulf. Dispersants break down oil into small droplets that easily mix with water and, in theory, biodegrade quickly. The intention is to reduce the amount of oil in an area, dispersing it throughout the water column. While debate continues over the efficacy of dispersants in cleaning up spills, their use continues to rise, despite little data on their suspected toxicity. For this reason, scientists have begun looking into the effects of these powerful chemicals on marine wildlife. 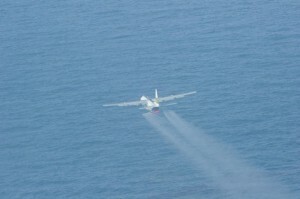 Chemical dispersants being sprayed into the Gulf following the BP oil spill. In a recent study out of the University of Southern Maine, “Chemical dispersants used in the Gulf of Mexico oil crisis are cytotoxic and genotoxic to sperm whale skin cells,” researchers tested the effects of the chemical dispersants Corexit 9500 and Corexit 9527 to sperm whale skin cells. There is a small population, around 1600 sperm whales, residing in the Gulf. Since these whales inhabit part of the area inundated with oil after the BP spill, there is a high chance some of these whales came into contact with oil, and with the dispersants. With so few whales, the population is highly susceptible to disturbance: any chaotic or harmful event threatens its overall vitality. In addition, the most recent IUCN Red List of Threatened Species classified sperm whales as Vulnerable, meaning they are at risk of extinction. Therefore, understanding the effects of chemical dispersants on sperm whales is critical for ensuring the population’s health and stability. To begin the process, researchers grew skin cells from samples obtained from Gulf whales before the spill. They applied varying concentrations of the two dispersants to the cultured cells, and measured the effects for one day. Since chemicals can be harmful in different ways, researchers studied the dispersants’ toxicity to the cells (called cytotoxicity) and to chromosomes (called genotoxicity). They found both dispersants to be poisonous to the cells, but only Corexit 9527 to be toxic to the cells’ genetic material. Cytotoxicity and genotoxicity have different implications. A chemical that is cytotoxic –poisonous only at the cellular level—may cause fatal or non-fatal issues for individual organisms, such as skin lesions or respiratory complications. A chemical that is genotoxic, that disrupts the functions of genes, can leave an imprint on the next generation. It may cause problems in mating, reproduction, or calf development. A sperm whale exposed to Corexit 9527 may be unable to reproduce. If she can reproduce, she may have mal-formed or non-reproductive offspring. Genotoxicity can have lingering detrimental effects on the population as a whole, endangering its future. While it would be valuable to know which dispersant is more toxic, researchers caution it is difficult to compare them because the effects are very different. Corexit 9500 was slightly more cytotoxic, but Corexit 9527 was significantly more genotoxic. Ultimately, the choice of which to use may depend on which outcome is more, or perhaps less, desirable. There is no way to determine how many whales were exposed to dispersants, nor the degree of exposure. But a 2014 study citing widespread health problems among Gulf marine mammals, including complications in fetus development, gives cause for concern. The population’s size, the toxicity of chemical dispersants, and reports of toxin-related health problems make clear that Gulf sperm whales are at risk. Researchers will continue monitoring the health of the population, and only time will illuminate the full effects. 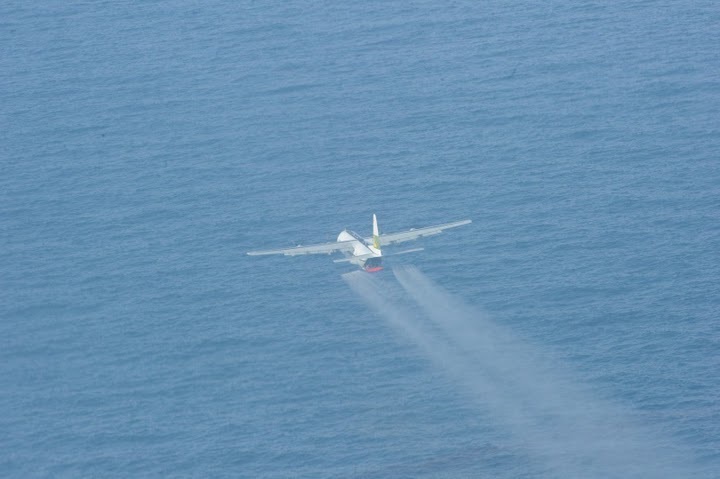 Until we know more, we’re left wondering: if dispersants harm wildlife, how useful are they?